Fabric uses cutting-edge defeat mechanism to turn high-powered rifle rounds into shrapnel. STAMFORD, Conn. — Echelon Materials today announced the launch of their Indiegogo campaign to fund the production of their proprietary loom required to produce TiTek, the world’s first and only patented, lightweight, flexible fabric designed to shred high-powered conical/rifle rounds and be comfortably worn or carried all day. With today’s increasing threats of high-powered rifles, and with heavy, rigid and uncomfortable armor as the norm, TiTek is finally the protection those in Law Enforcement deserve. The Indiegogo campaign has a funding goal of $825,000.00 USD which will go towards the manufacturing of the only loom able to mass produce the TiTek fabric for the marketplace. Supporters of the campaign will be able to claim a vest, shield and/or backpack infused with TiTek fabric as a reward. TiTek’s defeat mechanism is cutting-edge – it’s a patented fabric that weaves tiny, sharp-edged titanium discs into the plane of the fabric using the very kevlar threads that comprise the fabric. These discs present their sharp edges to the incoming round and cut it to shreds as it passes. 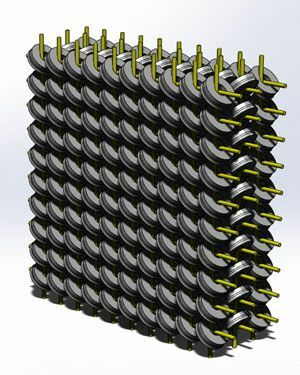 Once shredded by the TiTek fabric, debris from bullets is easily captured by the armor package’s backing layers that employ existing materials, such as aramids or polyethylenes. Compared to traditional armor that “stops” the bullet by applying counter-force; TiTek-infused armor uses the bullet’s own energy to cut it apart, destroying it and making it easier to stop. Heavy, inflexible ceramic plates can dig into an officer’s back, sink into their femoral arteries, or choke their throat. TiTek is flexible, and conforms to a body that needs to move, making it the perfect choice for both male and female officers, to not only protect, but also allow for a greater range of motion, coverage area and comfort for long-term use. “In testing the TiTek material, we have seen 7.62 x 59 FMJ M80 rounds turned into shrapnel - not a piece over the size of a 17-caliber BB - with bits and pieces spread over a 9-inch diameter in an armor pack weighing 1.9 lbs. per square foot,” said Bob Muller, Echelon Materials’ CEO. “This means that lightweight, flexible, breathable, rifle protection weighing up to 75% less than current Level IV+ plates is possible with TiTek, making that protection easier and more comfortable to wear,” added Muller. To become a supporter of the “TiTek Revolution”, visit Echelon’s Indiegogo fundraising site at igg.me/at/echelon-materials, or for more information about TiTek, visit www.echelonmaterials.com/. Echelon Materials has developed a new, patented fabric (U.S. Patent 7,100,490) with applications within the ballistic armoring industry. For more information, visit http://www.echelonmaterials.com/. Request more product info from Echelon Materials. Want to know more about Echelon Materials?